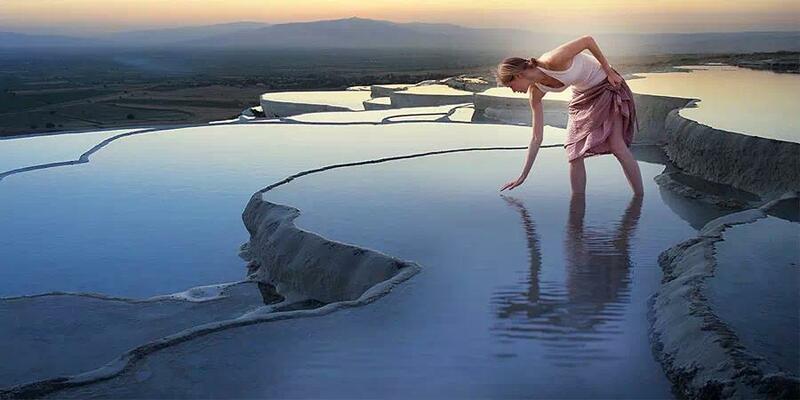 Pamukkale is a natural, cultural and historical place. And especially the city of Denizli is one of Turkey's most important tourist attractions. The naturalness and beauty found here has even entered the UNESCO World Heritage List. Carbonated water is completely clad with stones such as cotton, and it also warms and rests inside the human being. The waters contained here contain calcium oxide. In addition, it comes from Çaldağı'nın waters. Pamukkale, one of the most important tourist places, is one of the most important cities of the ancient city of Hierapolis and its ruins are located here. The ruins and museums of the Roman Empire are also located here. We strongly recommend to have your list of places to visit in Pamukkale at the first time. The travertines are formed by the effect of thermal waters coming from 17 different sources. The essence of the formations that make this part of Denizli a popular holiday destination is the calcium carbonate that accumulates as a precipitate. Be sure to have your camera with you while visiting these magnificent beauties, which offer a unique view with its white looks. The ancient city of Hierapolis, known as the i Holy City alı in the archaeological literature due to the intensity of the religious structures within it, was served by the order of King Eumenes II of Pergamon. Founded in the 2nd century. The ancient city, which was named after Telephos, the founder of Pergamon, had great destruction with earthquakes throughout its history. For this reason, the excavations carried out in the city, which was almost rebuilt during the period of the Roman Emperor Neron, were removed from the ground under the soil. The ancient pool formed as a result of an earthquake in the region is considered to be one of the important symbols of Pamukkale. In the vicinity of the pool where you can see the columns of the agora that was destroyed during the earthquake, there were more than 15 baths used by those who came to Hierapolis to seek healing. You can add to your list of places to visit in Pamukkale because it is one of the oldest ruins discovered in the region. Philippe Martyrion Church, north of Hierapolis. The name of the Prophet. One of Jesus' 12 apostles, the saint's religious structure after the Christ. It is thought to have been built in the 4th or 5th century. Inside the structure, it is believed that St. Philippe's grave was killed in this region where he came to spread the Christian faith. Kaklık Cave, which is located within the borders of Honaz District, attracts attention with its formations similar to Pamukkale Travertines. For this reason, it is believed that the sulfurous water dripping from the walls of the underground formation is good for skin diseases. The ancient city of Laodicea, which has a very important place in the Roman Empire, dates back to the BC. It was founded by Antiochus II between the years 261-263. The ancient city, which is known by the name of the founder of his wife, thanks to the high quality wool of the sheep species grown within the boundaries of BCE. In the 1st century, it became an important center in the field of textiles. A.D. Remains of the city, which was demolished by the earthquake in 60, were uncovered during the excavations of the ruins of the stadiums and the gymnasium sections, the monumental fountain and the temples. The Temple of Apollo, whose foundations date back to the late Hellenistic period, is another ancient building where you can add to your list of places to visit in Pamukkale to have an idea of the history of the region. The temple built on the Plutonion, a cave used for religious purposes in ancient times, is divided into 7 sections with 8 steps. As a result of the excavations, there are many statues dedicated to the gods.